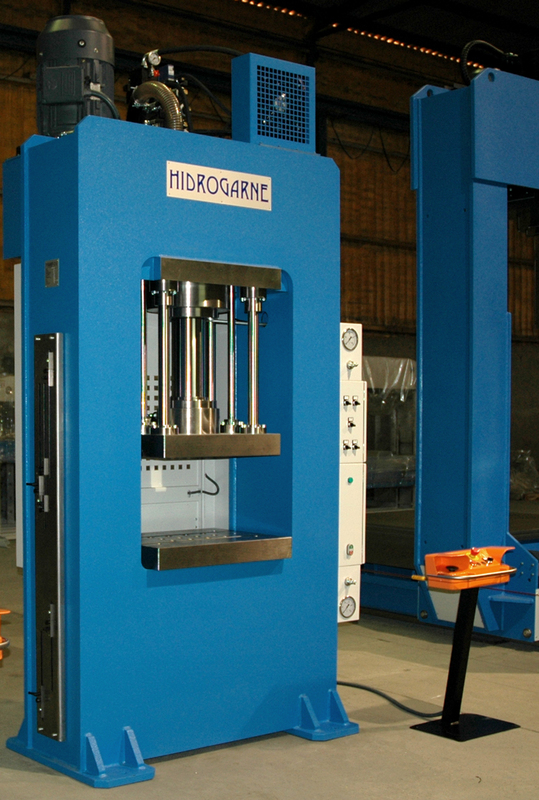 The RM-130 E hydraulic press with a solid-arch monoblock is optimized and specially manufactured for deep-drawing works. As all our R series hydraulic presses, this is equipped with a mechanized lower and upper CK-42 stainless steel table with two “T” DIN-650 grooves. Sturdy construction with closed sides. Upper table with four guides Ø 50 mm with bimetallic antifriction sockets of maintenance free. Main Cylinder of single acting with 130 tons includes pre -filled valve. 2 side cylinders for approach and quick return. Hydraulic unit located on the top rear. Pressure regulator for the cushion. Electric panel located on the right side. Three adjustable strokes ending for the upper table, two to adjust the table stroke and one to change the speed. Two stroke endings for the cushion, 2 limit switches in the pad, to forward and reverse. Pressure switch for end of cycle. Selector 1 or 2 speeds. Selector for manual or automatic cycle. Selector for the annulment of the hydraulic cushion. Selector for the annulment of the hydraulic ejector. Security module for bimanual and emergency stop.